When Nafir Suriyya—“The Clarion of Syria”—was penned between September 1860 and April 1861, its author Butrus al-­Bustani, a major figure in the modern Arabic Renaissance, had witnessed his homeland undergo unprecedented violence in what many today consider Lebanon’s first civil war. 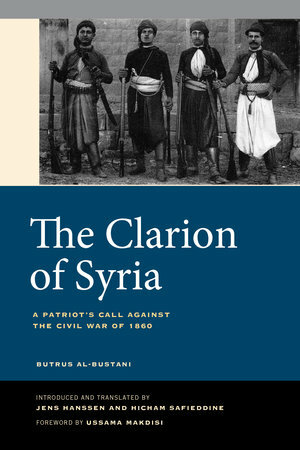 Written during Ottoman and European investigations into the causes and culprits of the atrocities, The Clarion of Syria is both a commentary on the politics of state intervention and social upheaval, and a set of visions for the future of Syrian society in the wake of conflict. This translation makes a key historical document accessible for the first time to an English audience. An introduction by the translators sketches the history that led up to the civil strife in Mt. Lebanon, outlines a brief biography of Butrus al-­Bustani, and provides an authoritative overview of the literary style and historiography of Nafir Suriyya. Rereading these pamphlets in the context of today’s political violence, in war-­torn Syria and elsewhere in the Arab world, helps us gain a critical and historical perspective on sectarianism, foreign invasions, conflict resolution, Western interventionism, and nationalist tropes of reconciliation. Butrus al-Bustani was a nineteenth century Ottoman Arab educator and public intellectual regarded by many as the first Syrian nationalist due to publication of Nafir Suriyya following the 1860 communal disturbances in Mt. Lebanon and Damascus. Jens Hanssen is Associate Professor of Arab Civilization, Middle Eastern, and Mediterranean history at the University of Toronto. He is author of Fin de Siècle Beirut and coeditor of Arabic Thought Beyond the Liberal Age and Arabic Thought Against the Authoritarian Age. Hicham Safieddine is Assistant Professor of History of the Modern Middle East at King’s College, London. He is co-founder and translation editor of e-publications Al-Akhbar English and The Legal Agenda English Edition.